SHALE CLIFF 'FOIL' STONE - TEMPORARILY OUT OF STOCK - Expected Spring 2019. Make effortless mountain rocks with flexible plastic Rock Sheets! Each sheet is .060" thick of tempered plastic embossed with deep rock textures. Stone-gray base color. Multi-scale. Click image for more details. SHALE CLIFF 'FOIL' STONE 33" x 14"
Shale Cliff 'Foil' Stone TEMPORARILY OUT OF STOCK - Expected Spring 2019. 33" x 11-1/2". 1-sheet Make effortless mountain rocks with flexible plastic Rock Sheets! Each sheet is .060" thick of tempered plastic embossed with deep rock textures. Stone-gray base color. Multi-scale. Click image for more details. BASALT ROCK 'FOIL' STONE 16¼" x 7" 2/PKG. TEMPORARILY OUT OF STOCK. Expected Spring 2019. Make effortless mountain rocks with flexible plastic Rock Sheets! Each sheet is .060" thick of tempered plastic embossed with deep rock textures. Stone-gray base color. Multi-scale. Click image for more details. BASALT ROCK 'FOIL' STONE 33" x 14"/1 pc. Basalt Rock 'Foil' Stone - TEMPORARILY OUT OF STOCK. Expected Spring 2019. 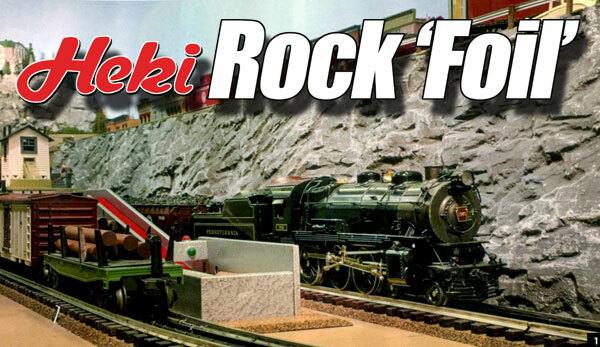 Make effortless mountain rocks with flexible plastic Rock Sheets! Each sheet is .060" thick of tempered plastic embossed with deep rock textures. Stone-gray base color. Multi-scale. Click image for more details. Measures 33" x 14-1/2". Hardrock Granite Cliff 'Foil' Stone - TEMPORARILY OUT OF STOCK - Expected Spring 2019. Hardrock Granite Cliff 'Foil' is a heavily textured rock-look film ideal for quick and easy designing of mountain landscapes. Simple to use. Just shape and press into place. Adhesive required. Contains two14¾" x 8½" sheets! HARDROCK GRANITE CLIFF 'FOIL' 29" X 9"
Hardrock Granite Cliff 'Foil' Stone - TEMPORARILY OUT OF STOCK. Expected Spring 2019. Hardrock Granite Cliff 'Foil' is a heavily textured rock-look film ideal for quick and easy designing of mountain landscapes. Simple to use. Just shape and press into place. Adhesive required. One sheet 29" x 9". Dolomite Strata Cliff 'Foil' Stone - TEMPORARILY OUT OF STOCK - Expected Spring 2019. Make effortless mountain rocks with flexible plastic Rock Sheets! Each sheet is .060" thick of tempered plastic embossed with deep rock textures. Stone-gray base color. Multi-scale. Two sheets measuring 16-1/4" x 7" high. Click image for more details. DOLOMITE STRATA CLIFF 'FOIL' 33" x 14½"
Dolomite Strata Cliff 'Foil' Stone - TEMPORARILY OUT OF STOCK - Expected Spring 2019. Dolomite Strata Cliff is a heavily textured rock-look film ideal for quick and easy designing of mountain landscapes. Simple to use. Just shape and press into place. Adhesive required. One piece measures 33" x 14½". GRAY LIMESTONE CLIFF 'FOIL' STONE 16¼" x 7"/2pkg. Gray Limestone Cliff 'Foil' Stone -TEMPORARILY OUT OF STOCK - Expected Spring 2019. Gray Limestone Cliff 'Foil' is a heavily textured rock-look film ideal for quick and easy designing of mountain landscapes. Simple to use. Just shape and press into place. Adhesive required. Two pieces. Each piece measures 16¼" x 7". GRAY LIMESTONE CLIFF 'FOIL' 33" x 14½"
Gray Limestone Cliff 'Foil' Stone -TEMPORARILY OUT OF STOCK - Expected Spring 2019. Gray Limestone Cliff 'Foil' is a heavily textured rock-look film ideal for quick and easy designing of mountain landscapes. Simple to use. Just shape and press into place. Adhesive required. One piece measures 33" x 14½".